We’d love your help. Let us know what’s wrong with this preview of Don't Write it Down by C.E. Wilson. Bestselling novelist Emma Ross isn’t satisfied being number two. She wants to be number one. She can’t stand always looking up to Jessen Blake – an amazing writer – but also a dead one. She vows that her next book will top the charts no matter what it takes. But after repeated encounters in her dreams with Jessen Blake hi Words have consequences. For some, more than others. To ask other readers questions about Don't Write it Down, please sign up. This is the first horror novel I have read in years and I absolutely loved it. I never considered how hard being a writer can be for the competitive spirit, and Emma Ross’s passion and dedication to winning the top spot may have had its consequences but I found it admirable. It may seem a little twisted to feel this way, but I also felt inspired after seeing how hard she worked herself to produce her best work. Even though the novella is short, C.E. Wilson was able to create such complex charact This is the first horror novel I have read in years and I absolutely loved it. I never considered how hard being a writer can be for the competitive spirit, and Emma Ross’s passion and dedication to winning the top spot may have had its consequences but I found it admirable. It may seem a little twisted to feel this way, but I also felt inspired after seeing how hard she worked herself to produce her best work. Even though the novella is short, C.E. Wilson was able to create such complex characters. Kevin’s character hit closest to home for me. The struggles he dealt with when caring for Emma had my heart breaking at how realistic his situation was. Combining Kevin’s unrelenting nature with Emma’s manic episodes, the relationship was explosive and could not have been written better. Jessen’s character was classic C.E. Wilson style (definitely Twilight Zone meets Tales from the Crypt), and I looked forward to every mysterious and ominous scene involving him. I can’t wait to see where the series will go from here! I am fully confident that it will be outstanding. I received a copy and volunteered to review it. Bravo! I was so excited reading this because I was so proud of c.e. Wilson for doing amazing on her first horror book! This book had me hooked from the first chapter. This plot was really cool and reminded me of deat Bravo! I was so excited reading this because I was so proud of c.e. Wilson for doing amazing on her first horror book! Review: Having read a lot of C. E. Wilson’s books primarily based in the fantasy and romance genres I was very eager to see how this author handles horror as it is quite a huge leap for authors to make. As a side note Stephanie Perkins has also done this transitioning from contemporary romance to horror with There's someone inside your house and I can't wait to read that either. So, all I can get from the blurb is that the protagonist Emma Rose is an author although always bested to the top spot by a dead author Jessen Blake and there that is a paranormal element that plays into it. We learn that at 25 Emma is in the process of getting divorced from her husband Kevin because he cheated on her - this I was fine with, what I wasn't fine with was the fact Emma blames herself because Kevin felt neglected because of her budding career and the amount of time she spent writing. While I understand the need to give Emma a real driving force and a backstory I didn’t like the way cheating was portrayed at all. As we cross the ¼ mark in the novel, Emma meets Jessen in a dream and he tells her that she can never be number one because it would be extremely dangerous for her but despite all his attempts to explain she still doesn’t understand why she can’t have what she wants and before he can go into more detail about the reasons why she wakes up. As we approach the halfway mark in the novel, Emma meets Jessen again in another dream and he once again tries to explain things to her, but he can’t tell her the actual reason she can’t become number one in plain terms and this only succeeds in making Emma angry. Her angry drives her to become better and surpass Jessen once and for all no matter the cost. Knowing he can’t change her mind Jessen gives Emma one last warning and hopes she will listen to him but even after learning that he has hundreds of books left to be published specifically to keep him at number one Emma is more determined that every to knock him off his perch. As we cross into the second half of the novel, Emma dreams of Jessen one last time and we learn of her real reasons for wanting to be number one and they aren’t selfish reasons. Jessen tells Emma that she is now number one and to be very careful as her words will hold power that she has to be conscious of. Emma doesn’t understand this and tries to get more information out of him, but he is literally rotting away before her. Jessen does manage to tell her she can always give the position back to him if she wants to but if she doesn’t then she will have to face the consequences of her decision. As we approach the ¾ mark in the novel, things get even more strange when Emma’s father dies in the exact same way the man similar to her father died in her new book. Absolutely freaked out she speaks to Jessen again and when he explains that her words killed her father she goes mental, saying in her next book she will kill him and end her nightmare when deep down she probably understands that it won’t go away until she gives the title of number one back to Jessen, but she is too proud to that. As we cross into the final section of the novel, after leaving Jessen Emma seems to be losing her mind little by little but she wasn’t sane to begin with as we know she should be on medication. As she prepares to kill Jessen in her new release despite him already being dead she heads further and further into her mania and even threatens to kill of Kevin when he tries to look out for her. In the final pages of this novel Emma truly dives into madness and everything comes to its climax. I thought this book might be written by a first-time writer and/or a teenager, so I was at first prepared to give some encouraging constructive criticism, but now that I know none of those things are true, I'm more shocked at how naive the story construction is. The story hinges on the main character being an NYT bestselling author (only she consistently hits #2, never #1). The author seems to have little understanding of how the NYT list works or what it takes to be on it. I laughed heartily at I thought this book might be written by a first-time writer and/or a teenager, so I was at first prepared to give some encouraging constructive criticism, but now that I know none of those things are true, I'm more shocked at how naive the story construction is. The story hinges on the main character being an NYT bestselling author (only she consistently hits #2, never #1). The author seems to have little understanding of how the NYT list works or what it takes to be on it. I laughed heartily at the main character's attempt to finally hit #1, which involved making her book gorier than ever. "I didn't care who needed to be raped, gutted, murdered, or mutilated..." She refers to having someone punch a baby in one of her previous bestsellers. I don't know if you've checked the New York Times list lately, but it doesn't often include splatter horror. The idea that upping the gore makes for more mainstream appeal is amusing. Bestselling horror writer Emma Ross consistently sits at the number two spot in the bestseller charts. Her competition, Jessen Blake has been deceased for three years -- yet still manages to release a new novel at the same time as her, continuously holding on to the coveted number one spot on the charts. Even in death Jessen has everything she's ever wanted, including movie deals and TV shows based off his books. Driven by her ambition, Emma vows to supersede Jessen. Writing feverishly she begin Bestselling horror writer Emma Ross consistently sits at the number two spot in the bestseller charts. Her competition, Jessen Blake has been deceased for three years -- yet still manages to release a new novel at the same time as her, continuously holding on to the coveted number one spot on the charts. Even in death Jessen has everything she's ever wanted, including movie deals and TV shows based off his books. Driven by her ambition, Emma vows to supersede Jessen. Writing feverishly she begins to lose touch with reality. In her dreams Jessen cryptically warns her to never become number one, which only pushes her harder. Soon Emma finds that even mere words can have unfathomable consequences. Although a daring departure from her normal genre, this book reiterates that the talented C.E. Wilson can effortlessly write that which she sets her mind upon. This is a short novel written in the same vein and reminiscent of Stephen King's compilation of short stories, JUST AFTER SUNSET. Suspenseful, creepy as well as thought-provoking, DON'T WRITE IT DOWN is complete with a clever plot, well-balanced characters and an unpredictable ending that will stay with you long after you turn the final page. ~ I received an advanced copy in exchange for my honest opinion. Emma Ross don't like being number two. She wants to be number one. In the Book selling world she number 2. But the #1 spot is being held by Jessen Blake who is a amazing writer but also a dead one. Her ghost warns Emma that she shouldn't try to be number 1, But Emma takes that as a challenge. This is a great short horror novella. Being a number 1 bestseller can be hell! Another great book from C.E. Wilson. This is her first stab at horror and she did it perfectly. She's definitely becoming one of my favorite authors. I have not hidden my admiration for indie author C.E. Wilson. She’s creative and prolific, and I’ve read almost everything she’s written and published in the past two or so years. And if I’ve missed something, it’s because she’s had an impressive output in that time span. One of the advantages of self-publishing is that authors determine their own book release schedule. Traditional publishing companies often restrict their authors to one book a year because of contracts, conflicts, and a whole b I have not hidden my admiration for indie author C.E. Wilson. She’s creative and prolific, and I’ve read almost everything she’s written and published in the past two or so years. And if I’ve missed something, it’s because she’s had an impressive output in that time span. One of the advantages of self-publishing is that authors determine their own book release schedule. Traditional publishing companies often restrict their authors to one book a year because of contracts, conflicts, and a whole bunch of legal reasons that I don’t fully understand. But this is already the third book of hers released this year that I’ve read. 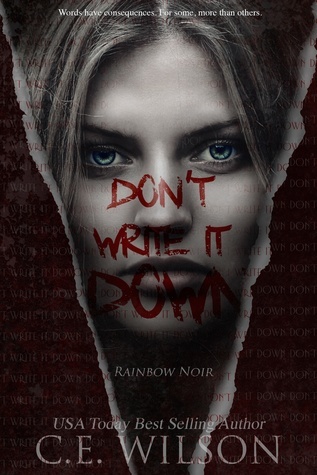 Don’t Write It Down is Wilson’s first book in her “Rainbow Noir” series of light horror books, and it’s got a fairly solid premise. Emma Ross is a horror author with the pen name of “Shade.” She has a complicated relationship with her parents, who never took her writing goals seriously; and a complicated relationship with her husband, who drifted away while she shut herself off from everyone else to write one of her books. But Emma’s most complicated relationship is with Jessen Blake, another horror author whose books always shoot to #1 on the best-seller lists, leaving her books at #2. Emma wants nothing more than to top the list, but every time she releases a book, so does he, which is quite curious because he’s dead. Before long, Emma is interacting with Jessen in her dreams, and he gives her a dire warning about claiming the top spot. Knowing that Wilson is a fan of the 50s/60s TV show The Twilight Zone (as am I), I instantly recalled the classic episode “A Game of Pool” where Jack Klugman plays a pool shark who wishes he could play a match against a deceased legend played by Jonathan Winters. Both stories deal with an obsessive challenger wanting to topple their respective champion, and both stories have that champion visit from beyond the grave in some way. Both stories contain intriguing dialogue and lessons about being on top and the persistence and consequences of fame, but the two stories diverge in the development of those after-effects, and Wilson then delves into the horror. I won’t spoil what that horror is, but like usual, I’m impressed with the idea of the horror Wilson puts forth. It didn’t frighten or startle me as much as I would have liked for a horror book, but she admits that the book is “light” horror. Maybe a little too light for me, but that’s not the primary issue I had with this book. Unfortunately, the timeline of events in the story confused me. Emma can apparently write and publish books within a couple of weeks. Now, I know this is possible for self-published books, and maybe she has enough of a social media following that she can sell a lot of copies right away, but what about all the other aspects that go into producing a book such as editing, cover design, and marketing? It’s clear that Emma isn’t exactly the most reliable narrator, and it’s in the story that she may be dealing with some kind of psychological disorder, so maybe the few days it supposedly takes her to complete a book is her inaccurate perception of the flow of time, but it pulled me out of the storyline too often. I’m sure lawyers have similarly reacted to how quickly trials move in movies and TV shows, or forensic investigators reacting to crime procedural scenes. Those scenes are often sped up to serve the telling of the story. Maybe my own personal experience—and my inability to write something that quickly due to a non-writing full-time job and a lack of discipline to sit in one place and write for more than a couple hours at a time—is blocking me from believing Emma’s writing/publishing timeline. But it does, and I feel bad about it because I’ve enjoyed so much of Wilson’s writing. I’ve read quite a few of C.E. Wilson’s books in the past and really enjoyed them, so I was more than happy to receive a copy of her first adult horror novel to review. This definitely wasn’t a perfect book, but I still found it enjoyable enough that I’ll be happy to pick up the next book in the series. The one thing that really stands out as something that I disliked was the way mental health was talked about in this book. I’m always hesitant to criticize individual novels for this because it is a huge problem within the horror genre as a whole (as well as mysteries and thrillers) – a LOT of horror books handle mental health really poorly and this was, unfortunately, not an exception. While it doesn’t necessarily rely on the whole “mentally ill people are evil and violent” trope it does use some stereotypes about mental health. It demonizes medications with the main character refusing to take them because they “turn her into a zombie” and would make it difficult for her to write. She constantly is judged as being “crazy” by people she knows. And towards the end, the main character unravels in a way that is very stereotypical for mentally ill characters. I’m having a hard time putting my exact thoughts into words here, but basically, if you’re someone who is hurt by stereotypical/negative portrayals of mentally ill people, you might want to skip this book. That’s really the only big problem I had with the book and, like I said, I’m hesitant to complain too much about it simply because it’s a genre problem, not an individual book/author problem. (That’s a subject for another time and not one to tackle in a review, truthfully.) My only other complaint would be that the book was a little predictable, but it wasn’t so predictable that it was boring or uninteresting so it wasn’t a huge problem for me. Actually, one more thing that was slightly frustrating was how long it took for the horror elements to really start. There’s a lot of creepiness and you definitely know that something bad is going to happen but, if I remember correctly, it was over halfway through the book before anything bad actually happened. Not a horrible thing, but like I said, it was a little frustrating. One last thing that I wouldn’t really call a complaint since it’s definitely just something that I personally don’t like, rather than an actual complaint about the book, is that I wasn’t expecting there to be such a focus on marital issues. Emma’s ex-husband plays a fairly large role and there’s a lot of talk about their problems, especially him cheating on her. I personally get really bored with these kinds of topics simply because they’re very unrelatable to me. Again, I wouldn’t really call this a complaint of mine since it has nothing to do with the actual writing, but it’s something I thought I’d mention. But don’t be fooled into thinking I didn’t like this story! While it wasn’t perfect, there was still plenty that I found to be enjoyable. For starters, it was really freaking captivating. Right from the first few pages, it had me hooked and I had a hard time putting it down, especially once it got closer to the end. I don’t even know what it really was that made it so engrossing, honestly, but you won’t catch me complaining about that! Don’t Write It Down was also quite creative and imaginative, as most of C.E. Wilson’s books are. Although like I said, some of it was predictable, there were small little descriptions and these fantastical or paranormal elements that were incorporated into the book which I really enjoyed. It added a little extra something to make the book that much more fun to read. Although Don’t Write It Down had some flaws, it’s still an enjoyable and imaginative book. If you’re in the mood for a horror book, but don’t want something that will take forever to read or that will scare you so much you have to sleep with the lights on (it’s creepy, but not that bad! ), this is an excellent choice. Not to mention, you can preorder it for your Kindle right now for only $0.99! Let me start off by saying that I'm a big fan of C.E. Wilson's other books. They are always very captivating to me, and this story still had many of the elements that I love in her writing. For starters, C.E. Wilson always does a fantastic job of writing descriptions of scenes, characters, and engrossing elements of the story in general. In Don't Write it Down, I loved how much detailed imagery was in the book, which added so m I received an ARC copy of this book in exchange for an honest review. For starters, C.E. Wilson always does a fantastic job of writing descriptions of scenes, characters, and engrossing elements of the story in general. In Don't Write it Down, I loved how much detailed imagery was in the book, which added so much to the horror element since I could clearly picture what I was supposed to be afraid of. Let's just say that this was one of those books that I didn't dare to read at night since I knew that it would creep me out to the point of not being able to sleep, and I consider that to be a good thing in this case. In terms of the characters, I thought that they were developed well, especially in terms of showing their vulnerabilities. Even if I ever felt like I was getting annoyed with a certain character's behavior, like if Emma was getting a bit hostile, or if her husband Kevin was a bit too insistent on spending time together, I was always brought back to the reasons why they acted like that. Everyone had their own story that clearly shaped their personalities instead of having simple, weak reasoning like "Emma is only mad at the world because she isn't #1" or something along those lines. The development of the characters made it easy for me to sympathize with them, dislike them when they were supposed to be seen in a bad light, and even like them in a way that kept me turning the pages. I was really engrossed with this book... until the ending. Up until that point, I could see that Emma was someone who struggled with her own demons a lot, and that included mental illness. However, the ending tended to harp on the mental illness part more than the rest of the book did, in my opinion, and it wasn't in a very good light. Without giving away what happens, I would just say that I felt that everything went a bit over the top with Emma. I could understand her emotions at some points, but at her one clear breaking point, I felt that the story was pushing her mental health problems a bit too much, and the events and images that show up as she spiraled out of control started to seem so random that I found myself almost laughing nervously as I wondered why those things would even come up. If those few images had been taken out or changed, then I think that I could've taken the ending a bit more seriously, but to me, it felt a bit too random at the end for me to even clearly focus on what happens to Emma. I still felt for her, but those feelings tended to be overshadowed by confusion and my disappointment for how her mental illness was being portrayed. Don’t Write It Down by C.E. Wilson, is a horror story about a young woman by the name of Emma. Emma aspires to be a number one bestselling author. She writes horror stories that are cringe worthy but no matter how hard she tries Emma keeps coming in as number two. Her competition, the one who keeps taking the number one spot, he’s dead. Every time she releases a new novel his publisher releases one that edges her out every time. However, this time Emma believes that she has the perfect story ide Don’t Write It Down by C.E. Wilson, is a horror story about a young woman by the name of Emma. Emma aspires to be a number one bestselling author. She writes horror stories that are cringe worthy but no matter how hard she tries Emma keeps coming in as number two. Her competition, the one who keeps taking the number one spot, he’s dead. Every time she releases a new novel his publisher releases one that edges her out every time. However, this time Emma believes that she has the perfect story idea and is intent on hitting number one. Things take a twist when he begins to visit her dreams with a cryptic warning, however, she dismisses his warnings as him just looking to try and keep his place despite being dead. But should she have heeded his warnings all along…to not write it down? Don’t Write It Down is the first novel that I have read by C.E. Wilson. When I learned that this was going to be a horror story I was very curious to see what it would be like. Being a fan of horror I was eager to read this book. Emma is an interesting character. She’s dealing with some personal issues that cloud her judgment. She is striving to be recognized by those who doubted her and she’ll do whatever it takes to acquire this. She holds a lot of resentment towards her husband who cheated on her and this goes to fuel her writing as well. This book has a few twists here and there and is an interesting read all together. There really isn’t anything that I don’t like about this book. It is a short read but I would have liked it more if there had been a bit more horror to it. I enjoyed getting some glimpses into the stories that Emma wrote as well. All in all, I’m rating this book 4 out of 5 stars. This is a unique story and a fun read. For those who like horror but without a lot of gore and violence then this is definitely a book for you to pick up and read. I've always loved this author for pushing my boundaries and opening my imagination, but this just didn't live up to my expectations. I went in blind, other than adoring the cover and was beyond lucky to receive an arc, but I don't think it was what I was expecting. Emma Ross is a best selling author writing under the pen name of Shade. Being a horror writer, her mind is constantly battling itself, her lifestyle too. Her goal?! To become #1 in the charts! My life was boring. I was dull. J I've always loved this author for pushing my boundaries and opening my imagination, but this just didn't live up to my expectations. I went in blind, other than adoring the cover and was beyond lucky to receive an arc, but I don't think it was what I was expecting. As her life becomes this haze of writing, dreaming about reaching that number one spot, no matter the cost and that pushing around her ex husband, I just got a little lost with it all. And it's the first time I've felt that way about this authors work. As emma struggles with reality and the notion that once her dreams become reality (quite literally! ), would she find happiness? Words have consequences. Some more than others. Reading Don't Write it Down by C.E. Wilson reminds me of riding a roller coaster. Scary, but you are pretty sure that you're in safe territory. Well, unless you are someone close to Emma Ross, the protagonist of this novel. The book reminded me of the "Frissons" novels I used to pour over when I was a teen, and it was incredibly difficult to put down. Despite the subject matter, it was never too horrifying, and I had no problems reading it in one go. If you are a fan of scary books, you will lik Reading Don't Write it Down by C.E. Wilson reminds me of riding a roller coaster. Scary, but you are pretty sure that you're in safe territory. Well, unless you are someone close to Emma Ross, the protagonist of this novel. The book reminded me of the "Frissons" novels I used to pour over when I was a teen, and it was incredibly difficult to put down. Despite the subject matter, it was never too horrifying, and I had no problems reading it in one go. If you are a fan of scary books, you will like this one. As usual, C.E. Wilson also includes a very thought provoking premise for the reader: "What would you do if attaining number one came with dire, dire consequences.” It is especially interesting to me as it involves an author and the consequences of writing. Even if you aren't directly causing the death of someone when publishing a novel, like Emma Ross does, I suppose publishing something that a person identifies themselves in, well that could also be difficult to deal with. All in all, I recommend this one wholeheartedly. I've made no secret about the fact that I'm a huge C.E. Wilson fan. What happens I've made no secret about the fact that I'm a huge C.E. Wilson fan. What happens when you're #1? Tied to two of C.E. Wilson's major themes (how power changes an individual and the power of words), characterization is particularly strong in this novel. We spend most of our time with Emma, a successful horror author on the heels of #1, constantly behind the late Jessen Blake. When she begins to have dreams about him during which he taunts her by saying she doesn't want to be #1, Emma resolves to do whatever it takes to be just that. Then...things start happening. This book is about an author Emma, trying to get to number one and will sacrifice anything to get there. Her only competition so far for number one is an author, Jessen, who has passed away young, but continues to release books when she does to keep her at number two. Emma locks herself away and drives deeper into madness as she blocks out everyone in her life and writes Day and night. Jessen begins to visit her dreams and warn her never to become number one or there will be consequences. Emma i This book is about an author Emma, trying to get to number one and will sacrifice anything to get there. Her only competition so far for number one is an author, Jessen, who has passed away young, but continues to release books when she does to keep her at number two. Emma locks herself away and drives deeper into madness as she blocks out everyone in her life and writes Day and night. Jessen begins to visit her dreams and warn her never to become number one or there will be consequences. Emma is so determined she brushes him off and finally gets her wish. Remember, be careful what you wish for. This book had me in chills at the end. You definitely won't put it down. I'm not the fan of horrors but when I find one good - I can love it! Just like this one - this is first horror story written by C.E. Wilson. It's pretty short story, but yet very complex - characters are full and have very developed personalities! I was afraid of Emma sometimes s her episodes were so real Add to it loving the husband that try to help her even after one night stand done by him. What will happen when becoming #1 means something more than just the position? Will Emma find a way to l I'm not the fan of horrors but when I find one good - I can love it! Just like this one - this is first horror story written by C.E. Wilson. It's pretty short story, but yet very complex - characters are full and have very developed personalities! I was afraid of Emma sometimes s her episodes were so real Add to it loving the husband that try to help her even after one night stand done by him. What will happen when becoming #1 means something more than just the position? Will Emma find a way to live with it? WOW!! I am so surprised by the turn of genre of book that CE has written.. Like SOOOOOO surprised but OMG was it AWESOME!! CE's books have always grabbed me and held on for dear life while reading but this one?? I did not want to stop!! She did such an awesome job building the characters and their parts in all of the chaos that makes up Emma's life. I am not going to go too far in fear of ruining it but know that you will be stuck to this book. A peerless novella with a intriguing plot & complex characters that are well intricated in the story. A unparalleled writing style that will captivate you. A one-click must for horror readers. I volunteerly reviewed an advanced reading copy of this Novella. I loved this book. It is CE Wilson's first horror novella and I was impressed. I was hooked right from the first chapter and read it in one sitting. CE Wilson is great at creating complex characters and Emma and Kevin are no exception. This is a great story to read at night time with the lights off. Awesome does not begin to describe this disturbing amazing dark book! C.E. never disappoints me and once again she has not. This new genre for her is AMAZING!! I love how twisted this story is and how well it flowed. I could NOT put it down all I wanted to do was keep reading I had to know what was going to happen next. Totally twisted crazy dark story!!! LOVED IT!! Very interesting story. Suspenseful with a need to go to an insane asylum. Not something I would typically read but have enjoyed reading this authors short stories with the endings such as this one. The cover is amazing. The main character in this story will leave you feeling intrigued and wanting more of her off kilter sense of humor. I loved this story. Yes it's dark and disturbing, but that's what makes it so good. Once I started reading this story I couldn't put it down. Just the idea that a number one horror author being able to influence people's death's with their writing is amazing. This story was just so awesome it dragged me in and I just had to know how it all played out... I need more of these. This book was something else. I loved the first half as the suspense kept you reading and you didn’t know what was going to happen. However, the story took a twist that I didn’t really expect or understand much which in turn made the book kind of bland near the end. You expect atleast an explanation of what’s going on or why it’s happening but nothing quenches those questions. I just finished reading this a few minutes ago. I really liked it, I like how the dreams mixed with reality for the main character, and the scary parts. Great job writing. double thumbs ups up, I wish her success with this new genre and am eagerly awaiting what she comes out with next !! Bravo, Author Wilson! Such an excellent horror story, enjoyed every descriptive page. Definitely, would love to see this turned into a modern-day Twilight Zone episode. So, looking forward to more books written in this genre.